We are fortunate to live in an area where several different species of hawks can be seen throughout the year — with even more species here during migration in spring and fall. 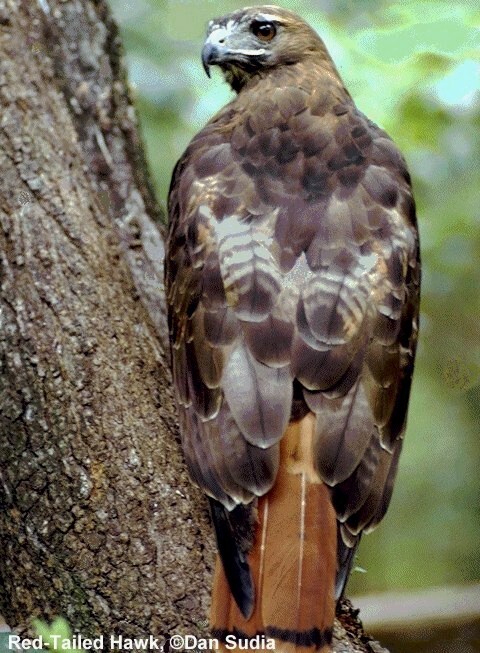 New Jersey's most common large hawk is the Red-tail, named for the rufous color of the adult's tail. Our Nature Guide Jon Latimer tells us about this year-round resident. 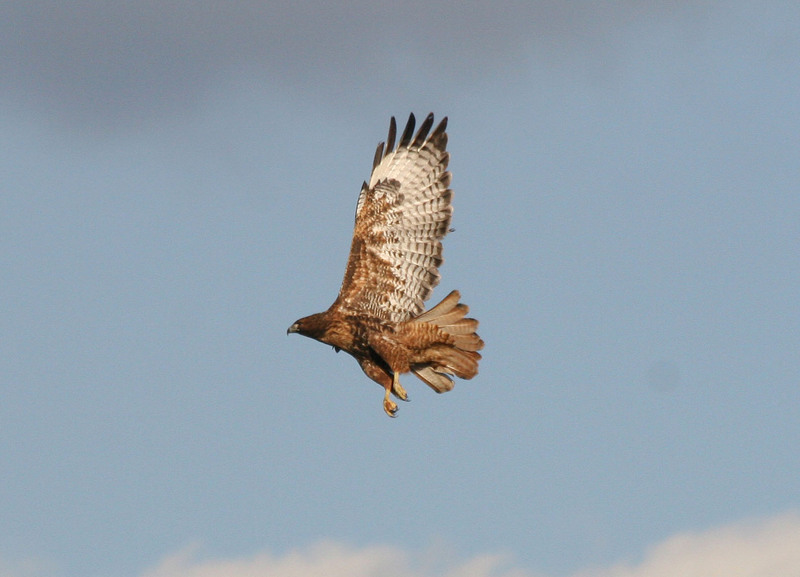 "Red-tailed Hawks, Buteo jamaicensis, are found in open country. They soar slowly in wide circles high overhead or perch on a telephone pole, fence post or tree along the edge of a field or highway. You are likely to see one any time you take a long car ride during daylight. You've probably heard one too. Whenever a hawk or an eagle appears in a movie, the shrill cry on the sound track is almost always a Red-tailed Hawk, no matter what species is being shown. "Red-tails are large hawks with very broad, rounded wings and a short, wide reddish tail. Adults can grow to over two feet long and have a wingspan of over four feet. Their wingbeats are slow and heavy. They sometimes hover in the wind without flapping their wings at all, keeping their eyes fixed on the ground to catch the movement of a vole or a rabbit. When they spot their prey, they make a slow, controlled dive with their legs outstretched. 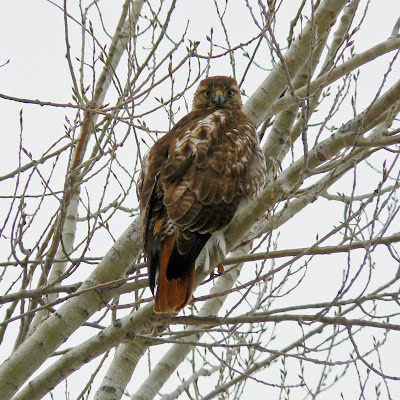 "There is some variation in the coloring of Red-tailed Hawks that can make identification difficult. Most have a rich brown back and a pale belly with dark streaks. Their tail is usually pale on the underside and cinnamon-red on top, with thin black bands near the tip. The tail of young birds is brown with light bands. 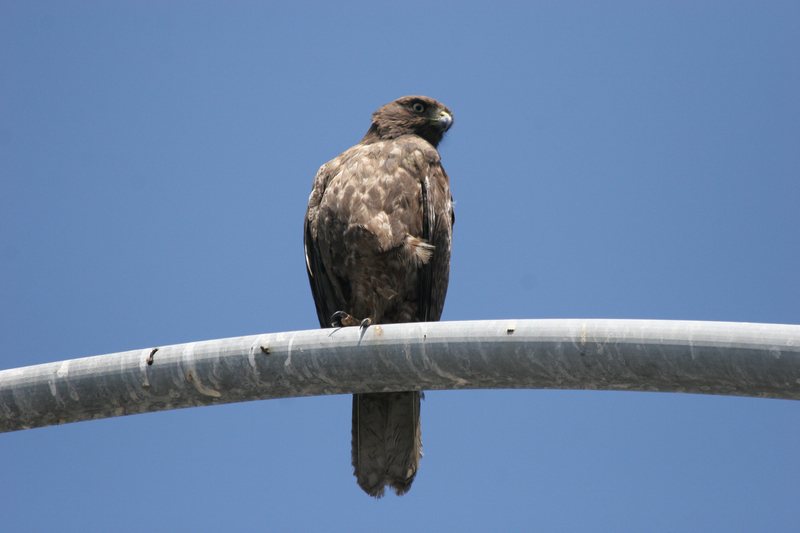 However, 'dark-phase' Red-tailed Hawks are chocolate-brown all over with a warm red tail. 'Rufous-phase' birds are reddish-brown on their chest and have a dark belly. Even at a distance, if you see a flash of red on the tail of a bird of prey, you can be sure that it is a Red-tailed Hawk."